An American Style Housewarming Thanks To Hog Roast Shirley! This week, the team at Hog Roast Shirley were contacted by a young American lady. Katie is from St Louis in Missouri, and has just recently arrived here in the U.K. She decided to throw a housewarming party to try and make some new friends, and so she invited everybody who lives on her street to come and join her for a night of spectacular food, drinks and laughter. She wanted us to provide excellent cuisine that had an American twist. Luckily for Katie, we are all too familiar with how they do things state’s side, as for years we have included the Southern Slow Roast Menu amongst our selection, which is packed full of variety. The guests were due at 7PM and Katie was expecting at least thirty people to show up, and so the team at Hog Roast Shirley arrived early in the afternoon to make all the preparations. Whilst our Chef butchered the meats and put them on the spit for roasting, our catering assistant set up a Gazebo in the garden that would house the serving table. When the guests started to arrive, Springsteen was playing and the smell of slow roasted meat was wafting through the air. There was plenty on the menu for the guests to choose from. 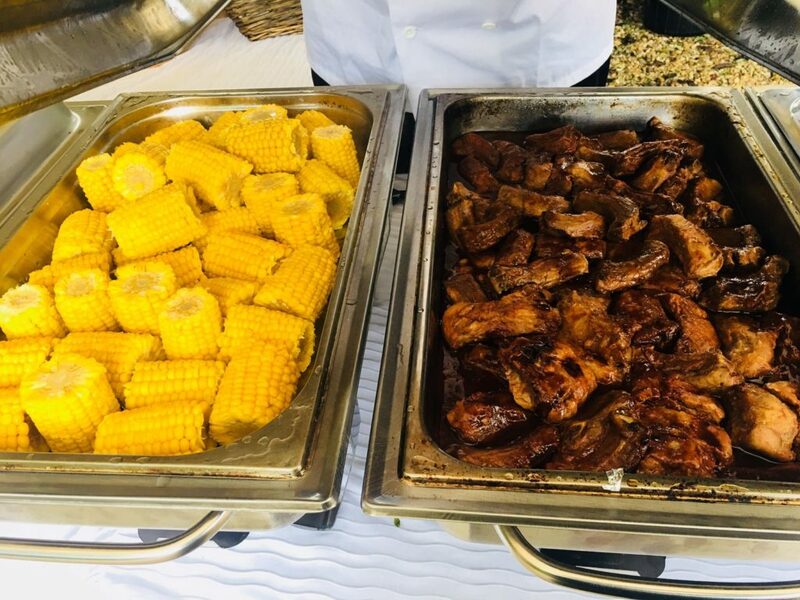 For meat, there was a choice of the Fall off the bone Louisiana Sticky Pork Ribs; the Texan 24hr Beef Brisket; or the Cajun Spiced Whole Roast Chickens- each marinated in our secret recipe rubs and packed full of slow roasted flavour. They were accompanied by our sauces – the Jack Dainels Smokey BBQ Glaze; The Cajun hot pepper sauce; or the Legendary Stubbs Hickory BBQ Sauce – as well as our sides: the Skin on Southern Style Whole Baked Potatoes; corn on the cob; or the Memphis Style Crunchy Coleslaw. Vegetarians also had the option of a Grilled Vegetable and Halloumi Wrap with Tzatziki Sauce. More guests had arrived than Katie had hoped for, but that was no problem for our chef who had plenty of food for everyone. When the job was done, the team at Hog Roast Shirley tidied away discreetly and quietly, leaving Katie and her guests to get to know each other a bit better.